This remote islands is an active volcano in the South Shetlands, off the Antarctic Peninsula. Its landscape comprises bare volcanic slopes, and ash-layered beaches and glaciers. The island is horse-shoe shaped with a large flooded caldera. 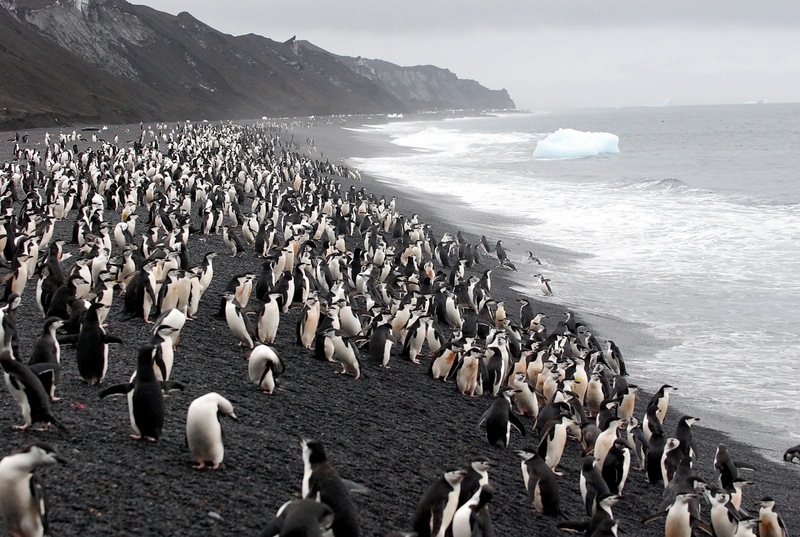 Nine seabird species breed on Deception, including the world's largest colony of chinstrap penguins Pygoscelis antarctica at Baily Head, on the south-west coast. An estimated 100,000 pairs nest here. 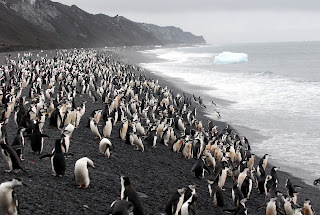 The only way to realistically get to Deception Island is to join an organised wildlife cruise of the Antarctic that takes in this incredible place. Photo of Chinstrap Penguins on the island by Doug Kirwin. This guest-house is located in the village of Sinemoretz near the border with Turkey in the south-east of Bulgaria, right on the Black Sea coast. The Strandja National Reserve, which is nearby, is an important forested hill region with various breeding raptors, resident woodpeckers and a speciality of this region Semi-coloured Flycatcher. The area is also a major migratory bottleneck site with more than 1000s of White Storks and 100s of eagles passing overhead each autumn. The villa is eco-friendly and birder-friendly and even arranges birding trips, with advanced notice, in conjunction with the Bulgarian Society For Bird Protection. Here is their website: Villa Philadephia. Adele Penguins by Doug Kirwin. 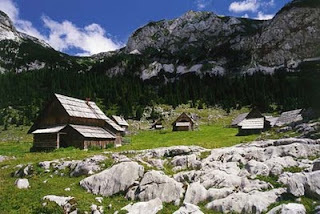 The Triglav NP lies in the Julian Alps in the north-west of Slovenia. It is around 800km2 of mostly rugged terrain with great scenery. The highest point is Mount Triglav at 2864m. Wildlife includes Chamois, Alpine Marmot, Mountain Hare, Golden Eagle and Wallcreeper. Though the tourist infrastructure is good, with marked trails and mountain huts and plenty of hotels lower down, this is ultimately trekking country and the weather can be unpredictable so good planning and proper gear are needed on any visit. The Calilegua Nacional Park lies in the south-east of the province of Jujuy, in the very north-west of Argentina. It was created in 1979 to preserve the Yungas forests of the pre-Andes, particularly the flora and fauna of cloud forest habitat. With a surface of 295 m2, it comprises the largest national park in the region and is crossed by marked trails. The park is rich in birdlife and the top-predator is Jaguar.